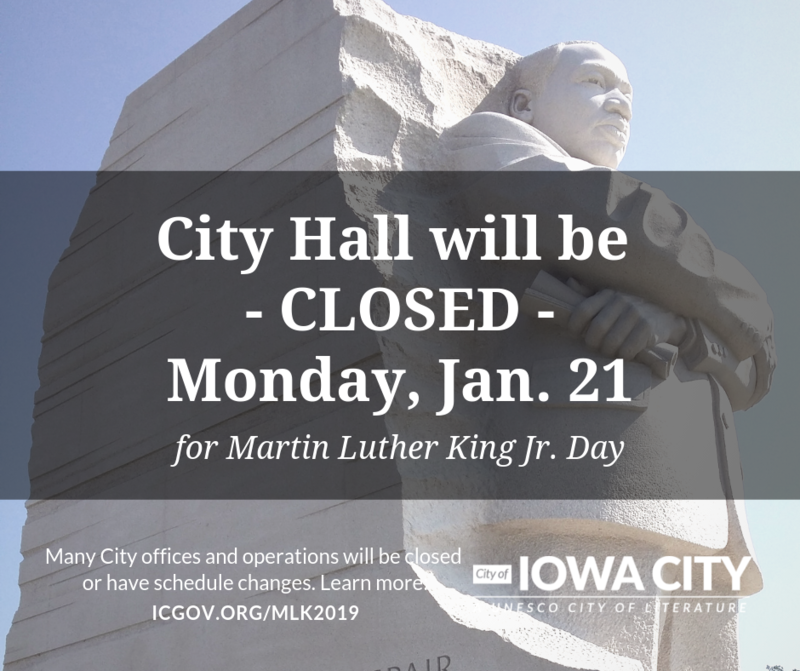 Administrative offices at City Hall will be closed on Monday, Jan. 21 2019, in observance of Martin Luther King, Jr. Day. The City is partnering with several local organizations to host an event celebrating the life and legacy of Dr. King. Note: Curbside garbage, organics and recycling will be collected on Martin Luther King Jr. Day. Customers on the Monday routes should have items to the curb per their normal schedule. Airport: Office will be closed, but Jet Air (FBO) will be open regular business hours. Library: Open 10 a.m. to 6 p.m.
Book Mobile: No Bookmobile Service. Parks and Recreation: Administrative offices closed, but Robert A. Lee Recreation Center, Mercer/Scanlon and pools will be open regular hours. Parking: Parking will run normal operations. Police: Patrol and station masters will be on duty. Records and administrative office closed. Senior Center: Closed. Elder Services will not serve senior meals. Trash & Recycling: Refuse, recycling, and organic waste will be picked up on Monday. Transit: Iowa City Transit will operate on a regular Saturday schedule from 6 a.m. to 7 p.m.
Water: The Water Division office will be closed; residents with a water emergency should call the 24-hour emergency line at 319-356-5166 for assistance. City offices and operations will return to normal schedules on Tuesday, Jan. 22. For more information, contact Communications Coordinator Shannon McMahon at 319-356-5058 or shannon-mcmahon@iowa-city.org.